At the beginning of April each year David Hall enters the 1950 Leyland Beaver in the C.T.P. 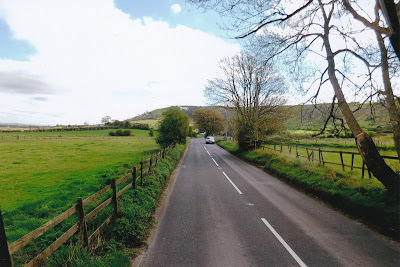 (Commercial Transport in Preservation) Three Wiltshire White Horse Road Run which encompasses the White Horses at Westbury, Alton Barnes and Cherhill, on the A4, near Calne. C.T.P. is an organisation for anyone interested in historic commercial vehicles, with meetings each month featuring talks from interesting speakers and 5 events each year when owners take their vehicle out on the road. For David it provides an opportunity to spend a day with Stuart Smith, whose Father had his final journey on the Leyland Beaver two years ago. It is also an opportunity for members of the public to see the vintage vehicles on the road and sometimes coverage of the Road Run in the Wiltshire Times broadens the awareness of Vintage Lorry Funerals. David also likes to speak with fellow enthusiasts who run similar vehicles. 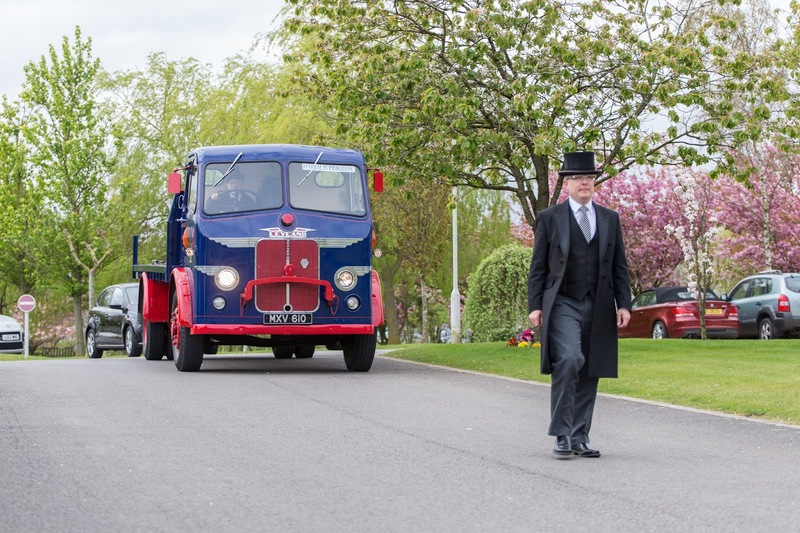 Around 30 vehicles were on the 2017 Road Run ranging in size from a small Morris former Post Office van through to the gigantic Eight Wheeled Atkinson and Draw Bar Trailer, driven by Tony Thompson. David also uses the Road Run to exhibit one of his funeral Themes and in 2017 it was a 1950’s TV Set with The Lone Ranger & Tonto on the screen. David was first at the start point at Warminster and Mary Bailey, C.T.P. Events Organiser, is always pleased that David can create time between funerals to take part in Road Runs. A number of vintage vehicles arrived and one member of the public complimented David on the cleanliness of the Leyland Beaver. The man said, ‘This Road Run is a fine opportunity for these vehicles to get out onto the roads once each year.’ David replied, ‘Actually my lorry is out and about 3 or 4 times each month’ and at the same time he handed the man a Vintage Lorry Funerals Business Card. The man was flabbergasted that he could have his final journey on the Leyland Beaver and he asked if he could keep the card, swiftly putting it into his wallet. The route involved going through small villages with very narrow streets and parked cars often providing obstacles. However, the biggest problems arose from inexperienced drivers who were unsure of the width of their cars. On a number of occasions David would pull into the side and invite oncoming cars to come through the gap, however, the inexperienced drivers would stop, unsure of what to do next. On one occasion a driver panicked, decided to reverse but stalled the car and then couldn’t easily start it again. The driver also had very poor reversing skills and eventually stopped forcing David to negotiate a tight gap, even narrower than the gap David had offered earlier to the driver. Stuart complimented David on his exemplary manners and demeanour towards other road users. Stuart and David decided to stop for their sandwiches on the A4 in a lay-bye opposite Solsbury Hill and Stuart commented how lucky they were to find such a spot, saying, ‘People come from all over the world to park here and see this ancient burial mound’. Within 5 minutes a large Mercedes Benz pulled in front of the Leyland Beaver and out stepped a well dressed man in his 40’s and an olive skinned young lady, who showed interest in the lorry. She asked if she could take a picture and explained that in her homeland, Sri Lanka, similar lorries are still on the road. David gave the young lady a Vintage Lorry Funerals Business Card, explained the lorry’s use and invited her to look at the 1950’s TV Set Theme. David said that some of the words that Tonto said are still relevant 60 years on, like “White man speak with forked tongue”. The olive skinned young lady then looked very sternly at her companion and David felt guilty that he had stumbled on a sensitive area. As Stuart and David were having their lunch David pointed out some of the changes he had made to the Leyland Beaver since Stuart was last in the cab. Included, was the picture of David’s Grandson, who sadly passed away aged 15 months on June 9th 2014, and the laminated picture of him smiling is now fixed above the windscreen on the right hand side of the wiper motor. Coming through a wooded area just after Seend there was a massive bang with something falling from the sky and hitting the Leyland Beaver. It all happened very quickly with David and Stuart seeing a black & white flash in front of the windscreen. David couldn’t stop with a number of vintage lorries travelling behind the Leyland Beaver, so he pulled into the next lay-bye. Four other vehicles followed David into the lay-bye and the drivers rushed to check that David was alright. An external inspection revealed that the cab was dented just above the windscreen. 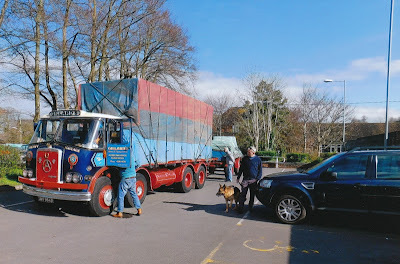 David remarked that it was just like being back in the 1950’s when it was common place for other Lorry Drivers to stop and investigate if they could be of any assistance to a Lorry Driver broken down by the side of the road. At the end of the Road Run at Crockerton Retail Park David laid out on the deck of the lorry three magazines featuring Obituary Articles that he had written, ranging in size from a quarter of a page, half a page and a two page spread. David said that only one of the families had thanked him for getting the article into the magazine and he asked Stuart and Sara to select which article had generated a response from the family. Sara chose the magnificent two page spread, however, her Dad chose the smallest article and Stuart was correct. Tony Thompson asked if David was alright and offered to polish out the mark the branch had made on the cab. There was a suggestion from Mary Bailey, C.T.P. Events Organiser that next year the April 2nd date for The Three White Horse Road Run may have to move until later in the month. David mentioned to Tony that the Road Run should be moved to the Sunday nearest April 17th and Tony agreed, suggesting a small detour to Rowden Hill in Chippenham and stopping at the Eddie Cochran memorial. Eddie Cochran performed his last concert at the Bristol Hippodrome on Saturday April 16th 1960. On Easter Sunday April 17th Eddie was in a taxi on its way to Heathrow, however, the car crashed on a bend on Rowden Hill and spun around into a concrete lamp post. The injuries that Eddie suffered were fatal and he passed away at 1610 hours in St. Martins Hospital Bath with his girl friend Sharon Sheeley by his bedside. On Monday April 3rd David’s wife washed and polished the lorry whilst David dismantled the Theme and prepared the deck for a minimalistic funeral in Westbury on Tuesday April 4th. It was amazing that during the Sunday Road Run the 1950 Leyland Beaver had been past Arthur W. Mays, Funeral Director, in Warminster Road, Westbury four times and David commented to Stuart that the narrow alleyway seemed to be getting narrower each time the lorry went past the entrance. On the Tuesday Arthur W. Mays staff stopped the traffic and gave David all the time he needed to reverse to the end of the drive. Anthony handed over a cheque inside a blank envelope and David thanked him for the cheque and for not writing on the envelope, which would enable David to reuse it. David thought to himself that Arthur had taught his men well. Since this funeral, Arthur has sadly passed away and the business is now run by Simon and Anthony. Whilst the Leyland Beaver was being paged into Semington Crematorium, Trevor Porter, Photographer, popped out from behind a tree and a picture of David behind the wheel appeared in the Wiltshire Times the following week. The second funeral in April was for Fred Stevens Funeral Directors in Nailsworth and the Deceased was one of the Bearers who had assisted David when he last worked there in 2010. The Deceased had been a Model Collector with over 630 model vehicles, never out of their boxes, stored on shelves in a temperature controlled room, from which light had been excluded. David created a replica Model Toy Box and the Family were delighted with his efforts. Two days before the funeral, David became aware of a massive hole that had been dug, but not re-filled, on the roadway into the Funeral Directors. David believes in providing solutions not problems so he brought with him lengths of 4 x 4 inches timber and created a ‘raft’ so that the 68 year old lorry could gently descend into the hole and then to climb out of it. The Deceased was a very practical guy and David felt that he was looking down and smiling as David gently manoeuvred the Leyland Beaver over the problem area. The Deceased’s Family came to the Funeral Directors to see their Dad on the vintage lorry and they wanted a photograph of his wife and children in front of the coffin. The Eldest Daughter was organising the photo-shoot when she sadly realised the battery was low on her mobile phone. David stepped forward and offered to help saying, ‘Can I be of any assistance? I have something in the cab called a camera!’ Everyone laughed and this provides a good example of how David uses self deprecating humour to create a distraction for grieving families on their darkest day. The crematorium selected on this Easter Saturday was Westerleigh, near Bristol, and the journey involved travelling 35 miles mainly down the A46. 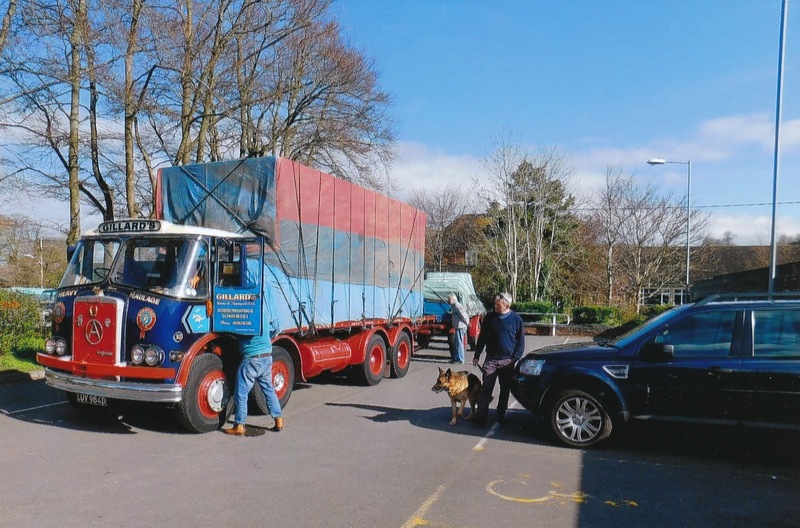 The first challenge was the very steep hill out of Nailsworth, however, assertive driving at the roundabout in the town centre enabled David to slip the 68 year old lorry into top gear and the old girl cruised up the hill at 25 m.p.h. Getting cars past in the early part of the journey wasn’t difficult with little traffic volumes and the long straight stretches of this former Roman Road. However, when the A433 from Tetbury joins the road the traffic density was increased. With over 50 cars trapped behind the Leyland Beaver at 30 m.p.h. David opted to pull over into a long lay-bye to let the cars past. Twenty cars roared past but the Driver of a grey Range Rover saw that David was coming towards the end of the lay-bye, he flashed his head lights twice and invited the Leyland Beaver, which was still in top gear, back onto the carriageway. The Range Rover was driven by someone attending the funeral, and he followed the Leyland Beaver all the way to the crematorium. The Range Rover Driver introduced himself to David after the service and explained that he was also a Lorry Driver. David said that he had deduced that from what he had done on the A46. Not only because he had flashed the Leyland Beaver out of the lay-bye but he had also demonstrated his knowledge of Lorry Drivers’ Signalling Code, which was prevalent in the 1950s ( Two Short Flashes means you come out, but one long flash means hold back because I’m coming through). Also at the Crematorium was a Photographic Student who took numerous pictures, one of which is exhibited below. David is indebted to Kieran Wakefield for allowing his images to be used to develop the awareness of Vintage Lorry Funerals.